Start What Were the First Animals on Earth? For some four billion years, no life existed on Earth more complex than a simple cell. Then, and for reasons still unknown, about 575 million years ago multicellular life forms suddenly began to multiply. That event, named the Avalon explosion, happened after the planet left behind the frigid phase of the Cryogenian Period to enter the Ediacaran, which lasted from 635 to 542 million years ago. Of the so-called Ediacaran or Precambrian biota, with more than 140 confirmed genera, today it continues to be pretty much unknown. For example, scientists don’t know with certainty if many of those creatures were animals, fungi, algae, lichens or simple protozoa, or if they left descendants in the following period (the Cambrian) or if they went extinct without a trace, like a failed life experiment. A recent study has shown that at least one of those creatures was undoubtedly an animal, which brings us a little closer to understanding the enigmatic history of the first complex organisms that inhabited our planet, of which we select some representatives below. For 70 years, scientists have debated whether Dickinsonia—a flat, oval and striated creature up to almost a metre and a half long—was an animal, a lichen or a giant protozoa, or if it belonged to another biologically-different category, perhaps extinct today. 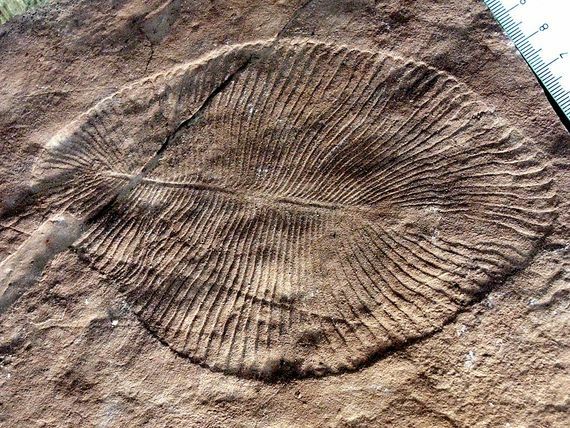 The first fossil was discovered in 1947 in Australia, becoming one of the most iconic and best-studied organisms of the Ediacaran biota, to the point that several different species have been identified. When in 1868 the Scottish geologist Alexander Murray discovered in Newfoundland, Canada some small disc-shaped markings in the rock, he could not imagine that he was opening an unknown primal chapter of the history of life on Earth. 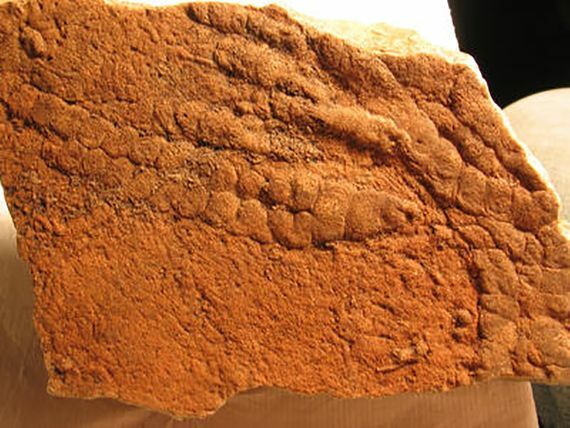 However, four years later, the palaeontologist Elkanah Billings proposed the idea that the strange circles were actually fossils, a suggestion that was dismissed at the time since they had been found in Precambrian rocks. Instead, it was argued that they had been formed by chemical deposits or gas bubbles. Almost a century would pass before there was a general recognition of the existence of macroscopic life prior to the Cambrian. Murray’s discs, together with others in different places, were assigned to the species Aspidella terranovica, but this case illustrates the current confusion about the reality of the Ediacaran biota: fossils initially identified as cnidarians (jellyfish) and classified as Aspidella and other genera, were probably not disc-shaped organisms, but rather the imprints of rhizoids—protuberances by which different creatures with the appearance of fronds are anchored to the substrate. 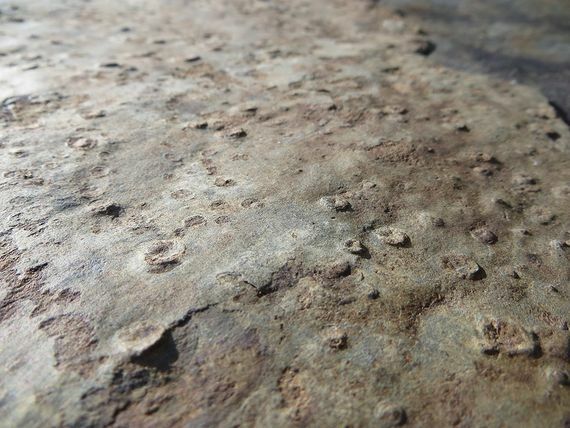 On the other hand, fossil prints similar to those left by anemones have also been found with Aspidella, which would support their classification as cnidarians. In short, uncertainty abounds. The Ediacaran seabed on which Dickinsonia crawled was populated by a variety of fern-like lifeforms anchored to the bottom. One of those organisms was Charnia, the first confirmed fossil that came from rocks prior to the Cambrian period, and therefore the one that formally inaugurated the study of the Ediacaran biota. After its discovery in England in 1958, its appearance of leaves with alternate branches, up to two metres long, suggested that it was a type of algae. However, when it was learned that it lived in waters too deep to carry out photosynthesis, it was reclassified as a pennatulacean, a group of modern animals related to corals. This hypothesis has also been refuted, and today Charnia is still a mystery. 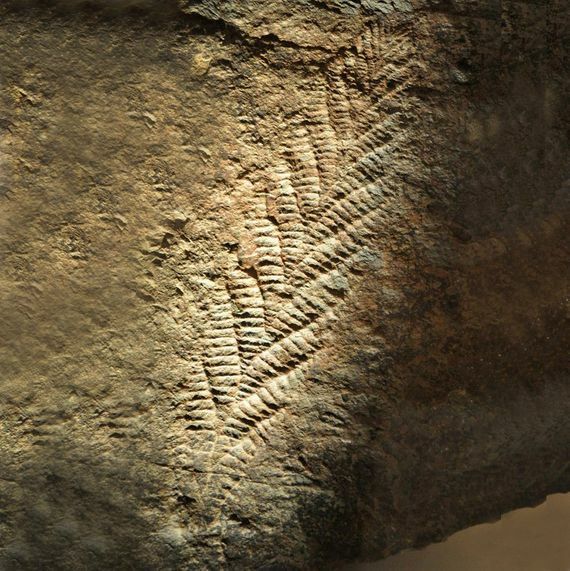 Its classification has been proposed in a tentative group called Vendobionta, a possible biological kingdom separate from the current ones that lived during the Ediacaran period and died with it. Like Dickinsonia, Kimberella was probably an animal that inhabited the terrestrial seas 555 million years ago. 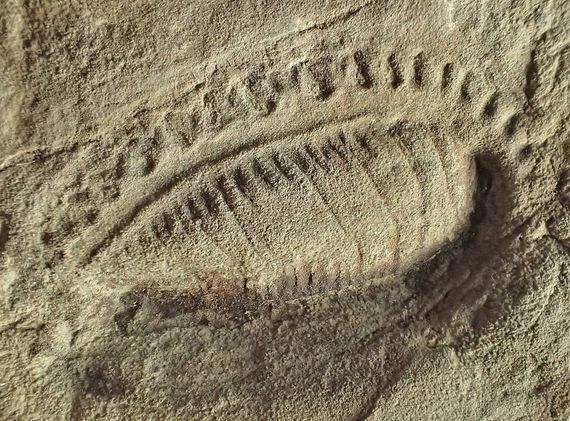 The bilateral symmetry of its body has led some scientists to propose that current species have inherited this basic plan of organization from our distant ancestors in the Ediacaran biota. Originally described in 1966, Kimberella was at first identified as a jellyfish. However, in 1997 more detailed studies of its structure and what looked like marks of a radula (toothed tongue) suggests that it should be classified as an ancestor mollusc of modern marine slugs, which possibly fed by scraping off the microbes present on the surface over which it moved. 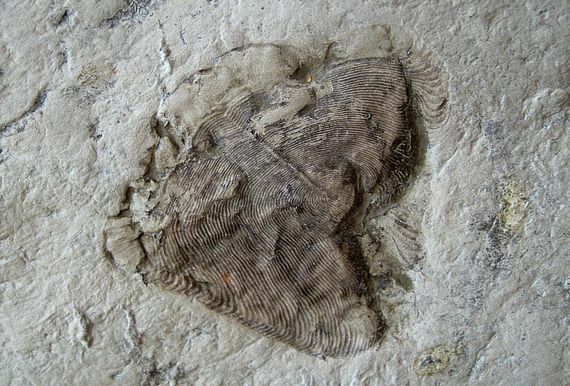 The more than 1,000 fossils found, up to 15 centimetres in length, have allowed scientists to understand in great detail the anatomy of its body, possibly covered by a soft shell, and have even led to speculation about its ecology and habits. The rich sets of fossils found in at least 25 Ediacaran sites around the world conjures up images of a panorama of sea bottoms where different flattened life forms crept or crawled in search of their sustenance. Along with Dickinsonia, another of those prehistoric mat-like creatures was Andiva, an organism up to 10 centimetres long whose body was probably covered by a thin soft shell. The same study that discovered the abundance of cholesterol in Dickinsonia did not achieve such clear results when analysing Andiva fossils, but its anatomical characteristics suggest that this contemporary of Kimberella was probably also an animal. Within the variety of life forms of the Ediacaran Period, Funisia represents the worms. The worm is not a biological taxonomy, but simply describes a heterogeneous group of animals that have in common a cylindrical shape and a soft body without limbs. Funisia may have been one of the inventors of this bodily organization. First described in 2008, it lived in colonies where it is suspected that it reproduced sexually, which would make it the oldest example yet found of this method of reproduction in an animal. Its classification has not yet been clearly determined, although it has been proposed that it could belong to the group of porifera (sponges) or cnidarians.